The Milwaukee M18 Brushless Threaded Rod Cutter is coming this March. The big deal is in its design to make overhead cutting more uniform and opening up your line of sight. While this model has a brushless motor, it’s not part of the Fuel lineup. Similar to the Compact Brushless Combo Milwaukee came out with, it has the advantages of a brushless design but isn’t one of their premium motors. The cutter jaws are set in 1-1/2″ from the front of the tool. When you’re cutting against material or hardware that the rod is attached to, it leaves uniform length that’s still short enough for a deep well socket to run the nut up. Auto-retracting jaws let you keep one hand on the tool and the other on the rod. When you’re working overhead, you don’t have to worry about dropping the wast end of the rod on coworkers below. If you’re pre-fabbing lengths of rod, you can cut and feed without stopping to release the jaws as you go. The cutting jaws are on the left corner of the tool. 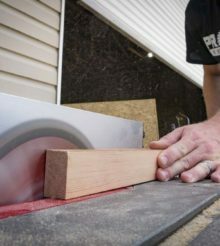 When you make cuts with your right hand, it puts the jaws and rod on the inside of the tool where it’s easy to see. Grinders and other tools you might use often leave imperfections that make it tough to get a nut started. Milwaukee promises burr-free cuts that you can hand thread nuts onto easier and faster than a hand cutter. The kit will come with a 2.0 Ah pack and Milwaukee tells us they’re getting more than 400 cuts on a charge – presumably on the 1/4″ diameter. It’s enough to make our team wonder if they could have pulled it off as part of their M12 lineup. To switch diameters, you use the onboard hex key to remove and rotate the die between 1/4″, 3/8″, and 1/2″ sizes. You can cut all three sizes with mild steel and stainless in the smaller two. Pretty slim competition, huh? Most dedicated tools for the job are either hand tools or large production level system like Greenlee’s Shear 30T.